The Book Guardian: I said hey, what's going on? Just found this draft from September 2014, so let's review and then update! Tomorrow I officially start my second year as a school librarian. Technically, I've been back for a few weeks, but the students will be joining us tomorrow. I'm much more ready this time around, but I still have my work cut out for me. It's helpful that the director of the school stopped by my office earlier this week to tell me how great of a job I'm doing! See yesterday's post for how that's going. Blake started his last year of school this week. Graduation is May 17, 2015! He's taking four classes, interning with the TSA, and is a dean's fellow this semester. In his spare time, he's already applying for Big Lawyer Jobs. 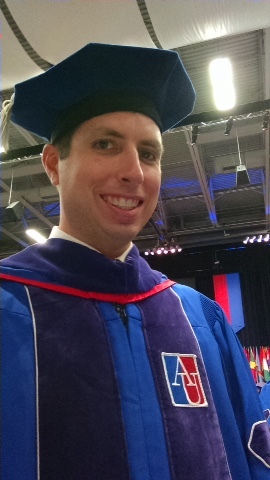 Blake did indeed graduate from law school on May 17, 2015! My parents, maternal grandparents, an aunt and uncle, his parents, and maternal grandmother all came to celebrate with us and it was wonderful. Blake and I orchestrated a fantastic itinerary for their trip and we all had a great time! It would have been nice if they called the right name at his graduation, but at least the right name is on his diploma. He also took and passed the Virginia bar exam! We're still waiting on the Big Lawyer Job to come through, but he's finishing up his Masters in the meantime. My apologies to Blake for not making this event a post of its own yet. It certainly deserves one! I'm so proud of this guy. Malcolm has been enjoying a lot of walks and trips to the dog park. I did a 100-mile walking challenge this month and he was my constant companion, though Blake joined us often. Our grand total this month was 104.7 miles. His favorite destination is the dog park, which is 4 miles round trip. Because of the success of August 2014's 100-mile challenge, I decided to walk 1,000 miles in 2015. As of yesterday I am at 892.4! Relatedly, I already need new walking shoes. And let's not discuss how many pairs of pants and shorts I've had to replace because of the increase in walking since Mal's adoption. I am HARD on my walking shoes. I'm on the third pair since this draft and I could probably use another new pair. I could also use a new pair of snow pants, because I wore mine out on walks with Malcolm during a very frigid winter last year. I think that covers at least a few of the major happiness from the last year! At my graduation my name was called out by our department head. We have a small department, 2 PhDs and 3 Masters were graduating at the time. When I saw who was going to be reading off our names my thought was "He'll get my name... No, he's going to mess it up." And he did.